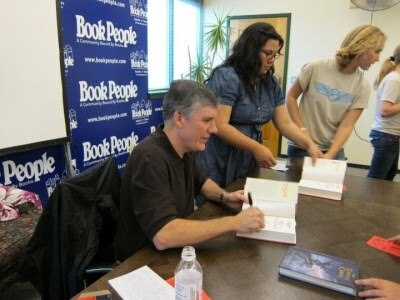 Stephanie, A History: Meeting Rick Riordan! Last week I met friends Katie and Jennifer and we decided to brave the crowd to meet author Rick Riordan! 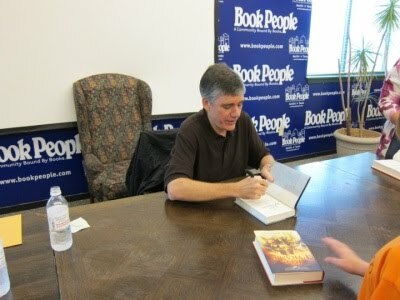 For those that don't know, Rick wrote the Percy Jackson series and has a new series coming out called The Red Pyramid. The party started at 4:00 at BookPeople. It was supposed to be a parking lot party (signing and activities and such outside), but we had horrible weather all day long. I was so afraid it was going to be a madhouse. I was in signing group M, and there were 50 people per letter of the alphabet. O.o I was so surprised how well everything was organized and how not-chaotic it seemed. I mean, there were a lot of people there, but I didn't really feel overwhelmed or anything. Sadly there were no posed pictures with Rick, but I managed to take a few candid shots! Enjoy!! One of the girls I go to college with had him for a teacher! Some folks are so lucky. Yeah I live in Austin, Amelia. :) He was in Dallas the day before he was in Austin!! wow! 50 people per letter?!! sounds like it could've been chaos in there.. so glad you got to meet him. Maybe I'll catch him next time he comes to town or Austin.